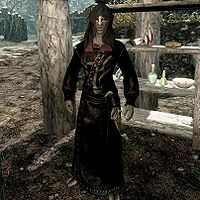 Sharamph, an Orc destruction mage, is wise woman of Mor Khazgur, the Orc stronghold west of Solitude. She is the mother of Chief Larak and Bagrak. She sells a variety of apothecary items, such as ingredients and potions. She sleeps in the longhouse every night between midnight and 8am then immediately heads outside and opens her little apothecary shop, at times using her alchemy lab. At 8pm she heads back inside the longhouse and spends four hours reading before bedtime. She wears black mage robes, a shrouded hood, and a pair of boots. She carries a leveled dagger (up to Orcish quality at level 6), the key to the longhouse and a selection of middle-class items and gold. When you approach her she will introduce herself: "I am wise woman to this stronghold." and also mention her son, Chief Larak: "Our chief is strong. That is all that matters." When you talk to her she will be eager to sell some of her products, saying: "I have poisons for your weapons, and cures for your ills. ", "Poisons can kill your enemies faster than any blade." and "Do not allow Ataxia to fester. A smart warrior keeps a potion to cure diseases at all times." If you approach her outside her opening times she will reject you with: "If you wish to trade, see me during daylight." She will also tell you about Orc tradition and the strong bonds with Malacath: "We have lived in Skyrim since before the Nords came. Our way is simple, all work to make the tribe strong. Only the bravest are allowed to lead, and to marry. A great chief is able to attract many wives and raise bold children. Wise women like myself are mothers of chieftains. We guide the tribe and advice [sic] our kin on what is most pleasing to Malacath." Lastly, she will elaborate on Malacath: "He is our creator and master. The Daedric Lord of the Sworn Oath and the Bloody Curse. Malacath teaches us to honor all words with action. To demand blood from your enemies and strength from your allies. He watches over all Orcs as his children. A truth those who leave the stronghold are quick to forget." This is the merchandise found in Sharamph's merchant chest. These items are only available if purchased from the merchant; they cannot be pickpocketed or stolen. They are restocked every two days. This page was last modified on 9 December 2016, at 17:57.